Though climbing is considered an extreme sport, it’s one of the safest when done right. When it comes to protecting a climber both knowledge and skill are required. The system used to ensure the safety of the climber involves two people held to each other by a single rope. The climber gets attached to the sharp end of the rope, and the belayer attaches themselves on the other end. The type of rope used in protecting the climber is dependent on what type of climbing you do. On one end, we have dynamic ropes that stretch when bearing a load. On the other, we have static ropes that have minimal stretch. Static ropes are normally used for caving, ascending a rope and rescues. These type of ropes are extremely perilous when used for top roping, mountaineering, or free climbing. For this reason, dynamic ropes are the preferred choice. Here are our top 5 picks for the best climbing ropes. The Petzl ARIAL rope takes into consideration your sense of style as it comes in a variety of colors. For example, the deep brown option will bar the rope from showing dirt while the bright orange one will stand out. 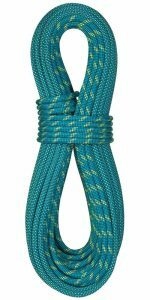 This single rope is a go-to when you are looking into venturing into top roping, trad climbing, and sport climbing. Its static elongation measures at 7.6% while the dynamic elongation at 32%. Its impact factor stands at 8.8Kn. The ARIAL comes in a variety of lengths including 60m, 70m, and 80m. You should be mindful of the length you need prior to purchasing a rope since insufficient length would mean that you would have to come off the end. The diameter of the rope is 9.5mm making it thinner and lightweight. It is treated dry thus will repel water upon getting wet. Upon lowering past the halfway mark, the ARIAL has a middle mark that alerts the belayer. 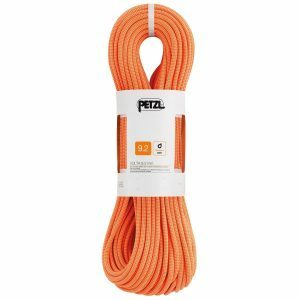 The Petzl Volta is a thin, all-terrain, lightweight rope that can withstand any type of climbing. If you are a beginner, it is advisable to keep away from this rope due to its thin diameter that requires skillful handling. 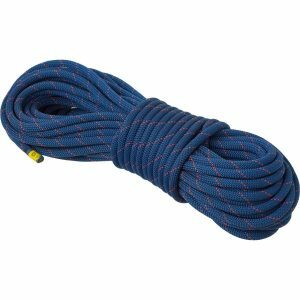 This rope is meant for any type of climbing as it is certified as a half, twin, or single rope. However, the skinny diameter makes it more susceptible to wear and tear. For this reason, you are advised to avoid top roping and climbing that involves hanging for long periods of time. When it comes to safety ratings, the different Petzl Volta rope types have their own safety ratings. For example, its single rope has an impact force of 8.7Kn, dynamic elongation of 34% and a static elongation of 7.8%. The rope is available in an array of lengths: 30m, 50m, 60m, 80m, 70m, and 100m. It measures at 9.2mm in diameter making it lightweight and difficult to handle. The Petzl climbing rope has a middle mark which notifies the climber once over half the rope has been utilized. It is also dry treated hence it will repel water during wet conditions thus making it a favorable choice for multi-pitch climbing. Its multiple certifications make it a good choice for multi-pitch trad climbing, ice climbing as well as mountaineering. It also works well for single pitch trad and sport climbing, but, you should avoid hanging on it for long. Each rope under this name is certified with its own safety ratings. For example, the single one has its static elongation of 8.0%, impact force of 8.5Kn, dynamic elongation of 25.4 and can take 7 UIAA falls. They are available in an array of lengths including 30m, 40m, 60m, 70m, 80m, and 50m. However, the bicolor version is available only at specific lengths including 60m, 70m, and 80m. It is a very skinny rope of 9.0 mm. It is also good to know that it’s a dry rope with a specialized feature known as DryCore technology, where the core is treated but not the sheath. If you are into indoor sport climbing, then the Sterling Slim Gym rope is the perfect choice for you. It comes in shorter lengths making it easier to maneuver around shorter indoor walls that are less than 12 to 15 meters. This single rope has a static elongation of 8.5% with a dynamic elongation of 35.4%. It also has an impact force of 8.7Kn and can take up to 6 UIAA falls. The Slim Gym comes in an array of lengths ranging from 25m, 30m, 200m, and 100m. The short lengths are for those who wish to take on sport climbing on short walls. Prior to making a purchase, ensure that you double-check the length of the gym walls. The long lengths are meant for gym owners who would wish to purchase in bulk. The diameter measures at 10.1mm which is quite thick. This thickness makes it ideal for gym climbing as it moves slowly through a belay device. The Bluewater Icon is the perfect climbing rope for advanced climbers due to its skinny and lightweight properties. You can count on this rope as you hike into the depths of the backcountry or whatever climbing adventure you might have in mind. 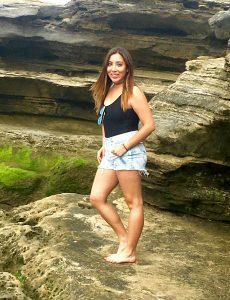 It comes in a wide variety of colors, therefore, you have an array of options to choose from. It’s a single rope and the go-to choice when you are planning to go on either trad climbing or sport climbing. Available at 70m, 80m, and 60m, its diameter measures 9.1mm making it very skinny. Its skinny nature makes it lightweight but also difficult to handle thus requiring an expert and attentive belay. 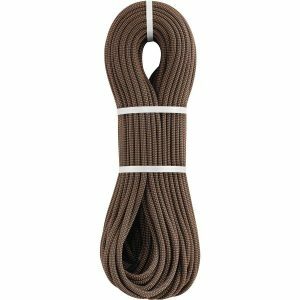 Not only does it come in bicolor options but is also a double-dry treated rope, as both its core and sheath repel water. There are two major categories namely; dynamic and static climbing ropes. Dynamic climbing ropes are able to stretch thus absorbing the impact in the event that the climber falls. Static ropes have minimal stretching capability making them efficient in instances such as ascending a rope. It is not advisable to use static ropes for lead climbing or top roping since they have not been tested nor designed for such kind of expeditions. Dynamic ropes are further classified into half, single and twin ropes. Single ropes are designed to be used only by themselves unlike other types of ropes. They are best for sports climbing, top roping, trad climbing and big-wall climbing. Half ropes are designed in such a way that you have two ropes, with one on the right and the other on the left. They are a go-to when it comes to mountaineering, ice climbing, trad climbing on multi-pitch rock routes. Twin ropes have a two-rope system whereby one ought to clip both strands through every piece of protection. They are best for mountaineering, ice climbing, and trad climbing on rock routes. When choosing the right length to purchase, keep in mind that the rope should be long enough, whereby half its length is greater or equal to the pitch that is to be climbed. If you are looking forward to climbing a 30m long route, then a 60m rope will be required. When it comes to indoor climbing ropes, shorter lengths are preferred. In most cases, 35m long ropes are used particularly in gym climbing. 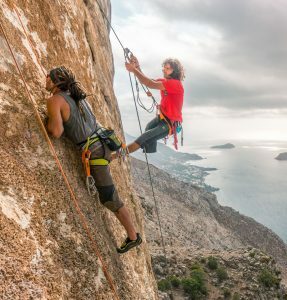 Either way, the rope should be long enough to allow the climber to lower safely. Static ropes used for climbing by ascenders come in an array of lengths. Some are sold per foot hence enabling you to get the exact needed length. Looking at rope diameter, skinnier ropes are much lighter and less durable. Thicker-diameter ropes are more abrasion-resistant and more durable upon frequent use. Skinnier lighter ropes are normally used for multi-pitch climbs that involve hiking long distances. Thicker ropes are more suited for top roping. This is a factor highly influenced by the ropes length and diameter. Generally, a thicker rope will be heavier than a skinnier rope. When it comes to dynamic climbing ropes, it is standard for them to be labeled as grams per meter. Weight for static climbing ropes is measured in weight per foot. This makes it easy to make a comparison of the weight of ropes of different lengths. Have a look at the features below when making a comparison between different climbing ropes. These features make a difference in ease of use and performance. Dry treatment is one of those factors you ought to look out for. Upon absorbing water, the rope loses its strength and gets heavier. Dry-treated ropes are able to combat this by reducing water absorption. It is good to know that dry-treated ropes are costlier than non-dry-treated ones. If you are into sport climbing, then a non-dry rope is sufficient enough. On the other hand, if you are into multi-pitch trad climbing or ice climbing, it is better to choose a dry-treated rope. The other feature is the middle mark. Most climbing ropes have this especially in a black dye which is helpful in identifying the center of the rope. This is essential when rappelling. Some ropes are known as bicolor have a different weave pattern which helps differentiate the two halves. This makes it easy to identify the middle mark and also better than having a middle mark which can easily fade. This is simply the stretching distance of a rope particularly during its first fall. The greater the elongation, the longer the fall. Elongation on a twin and single rope cannot go past 10% of the total length. On the other hand, half ropes do not exceed 13 percent. This feature is particularly crucial when hauling gear, climbing fixed ropes, and top-rope climbing. Higher static elongation is an indication of less efficiency since energy is wasted as the rope stretches. The desired use, diameter, safety ratings, and your budget will go a long way in helping you choose the right climbing rope. 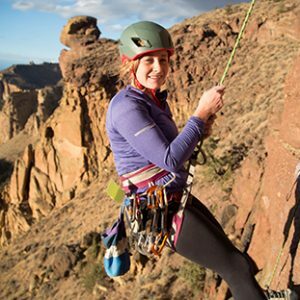 Regardless of whether you are a beginner or a professional climber the list above will form excellent alternatives for you to choose from. Bicolor availability and middle mark properties are also important considerations when it comes to alerting the belayer upon lowering past the halfway mark. It is also important that you have a feel of the rope to ensure that it has the desired strength and stretch for what it is you want to buy it for. Get one of these climbing ropes the next time you are planning to head out for a climbing expedition, whether on your own or with your friends.